You got to love how a little thing like an airline's in-flight meal promotion can open a window to another culture. Back in 1974, when Colonel Sanders first brought his fried chicken to Japan, residents might have thought Kentuckians wore white suits, white beards and black bolo ties, while standing over the fry pot cooking chicken. Okay, so it was a narrow peek into the culture of the American south, in a time before Facebook and Youtube. But even in today's seemingly limitless information age, it was still surprising to learn from a Japan Airlines news release, that yesterday's Southern culinary icon is part of present-day Japanese tradition. 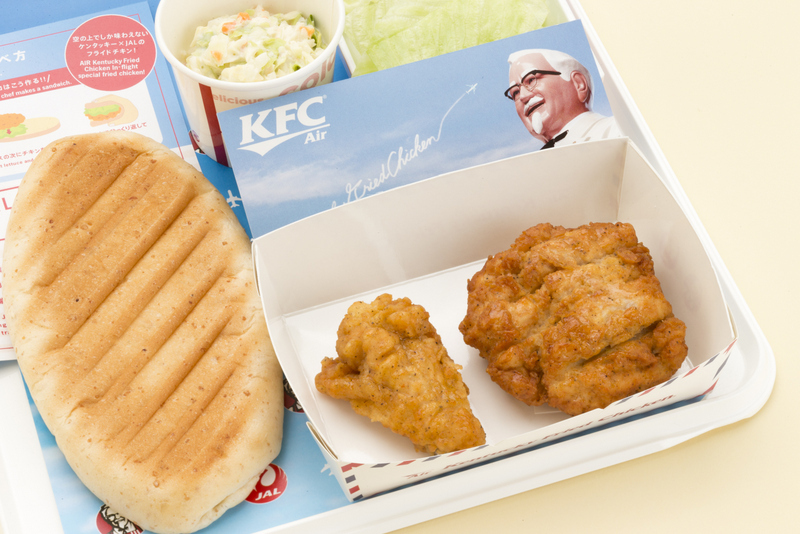 From December to February, economy and premium economy class customers on JAL flights between Narita and destinations in the United States and Europe will be served special KFC fried chicken snacks in a "special box and tray mat". 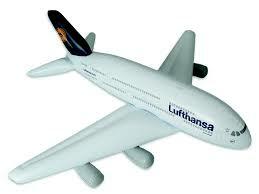 Folks these days are so health conscious, I had to ask JAL spokeswoman Sze Hunn, "What's up with that?" 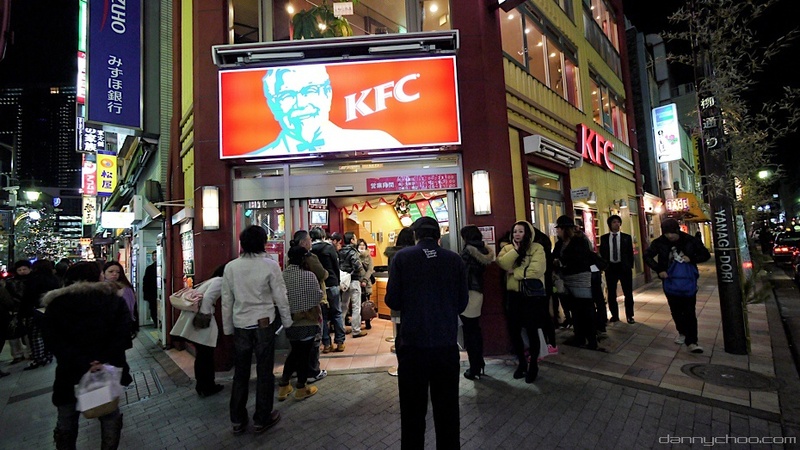 "KFC is closely associated with the Christmas season," Sze answered in an email. A little research shows she's right. A long ago marketing campaign by the company took advantage of expats looking for turkey for the holidays in a country where those critters don't roam, and the next thing you know the Japanese have developed a taste for, well let's just call it chicken tempura. On my recent trip to Narita, I ate fried avocado. That was novel. And delicious. 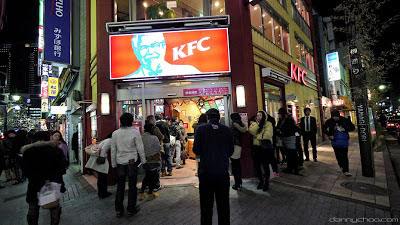 Over the years KFC's Christmas/chicken connection in Japan has evolved so that it now includes a Santa-suited Col. Sanders holding a bucket full of candy canes, a special plastic holiday plate and hours long queues of people eager to bring Southern-style poultry home to celebrate the birth of Christ in whatever way Buddhists and Shintoists do. Savor the chicken as is, or as "a sandwich by sandwiching the fresh lettuce leaves and fragrant fillet in the bread and topping it off with special mayonnaise." Special mayonnaise? Fragrant fillet? Put that way and it does sound appetizing. The best aviation-themed meal I ever had was just a few months ago, while visiting Narita's Museum of Aeronautical Science. I ate at the window-lined cafe overlooking the runway of Narita International Airport. Everyday curry with rice is never more delicious than when consumed off a jumbo-jet shaped plate as the real thing roars on by overhead. Query: Does this person write for a livinig?